Robert J. Randisi brings the sad news that California author and painter Kenn Davis, the creator of San Francisco private eye Carter Bascombe--died from a heart attack on January 12. He was 77. My mother and my younger brother and I moved to San Francisco when I was about 5 or so. I attended grammar school there--and went to painting (finger painting) and drawing classes on Saturdays at the San Francisco Museum of Art (cost a dime to attend). I think I only went to the classes 6 or 8 times; a dime was hard to come by for my mother. The museum later became the San Francisco Modern Museum. At age 10, [in] 1942, at the beginning of WWII, my brother and I were sent off to boarding school. It was there that I decided I wanted to be a newspaper comic strip artist, and drew everything in sight, other kids, priests, nuns, gardens, warplanes, and studied hard to grasp anatomy and how things were constructed. I continued to have strange dreams and often regaled my classmates with the stories in my mind; I tried to draw some of my dreams; and odd concepts they were. Finally I attended San Francisco City College, and fell passionately under the spell of modern art. As a child of the Depression I was only vaguely aware of modern art. The first time I was exposed to the paintings of Giorgio de Chirico I was jolted out of my seat; Imagine! Somebody had paintied [sic] my dreams. WOW! The art teachers told us students that who or whatever was inside each of us, our art should come from the person inside ourselves. Our personalities would dictate what kind of artist we would become (assuming any of us pursued any kind of artistic career). Much to my parents’ chagrin I put aside my comic strip career. According to another short online biography, artist Davis worked primarily with surrealistic concepts, “frequently in a satirical vein. In exhibitions throughout his home state of California, as well as in New York, Chicago, Boston, Houston, Denver and in museums shows in San Francisco and Dallas, Davis demonstrated his fascination with imagination. His work was often disconcerting and deliberately so. ‘There is enough art that lulls us into feeling right with the world, but to be stimulated by the artist brings us to another level of appreciation.’ With one eye on the European Surrealists Davis admires, he casts the other directly upon the AMERICAN SCENE--and on the obsessions, passions and foibles peculiar to our time and place.” More of his paintings can be seen here. Instead, Davis and Stanley went on to produce a really low-budget horror-comedy movie called Nightmare in Blood. Its plot, as the International Movie Database (IMDb) recalls, revolved around “attendees at a horror-film convention in San Francisco [who] keep disappearing. It turns out that the guest of honor is a real vampire, and his henchmen are kidnapping the convention guests. A horror writer, a Sherlock Holmes fan, and an Israeli Nazi-hunter set out to stop him.” Nightmare in Blood, released in 1978, has since become a favorite of “creature feature” film series. Even before Nightmare was released, Davis had converted the screenplay for The Dark Side of the Hunt into a novel, titled simply, The Dark Side. (While that book is jointly attributed to Davis and Stanley, the latter says, “I really didn’t write it.”) Published in 1976, The Dark Side was the opening entry in what would eventually become an eight-book series. Both The Dark Side and a later installment, Words Can Kill (1984), were nominated for Edgar Awards in the category of Best Paperback Original. For those who want a P.I. with good taste, you can hardly do better than Carver Bascombe, originally created by Kenn Davis and John Stanley in The Dark Side (1976), but continued for the next seven books by Davis alone, the series concluding with 1990’s Blood of Poets. Bascombe’s a young Vietnam vet with a military police background, who’s now an ambitious, art-loving private eye and part-time student working his way through law school in San Francisco. Bascombe’s passion comes in handy, because his cases invariably involve the arts somehow, be it opera, drama, literature, art photography, ballet, painting or poetry. The first few novels in this series were uneven, but by the fourth one, the Shamus-nominated Melting Point (1986), Davis had really hit his stride, with Bascombe sweating out a long, hot summer waiting to hear if he’s passed the bar, while at the same time he hunts down a missing sculptor. Early on in his creation of the Bascombe series, Davis took a break to team up once more with John Stanley and compose a standalone “celebrity mystery” starring movie tough-guy Humphrey Bogart. 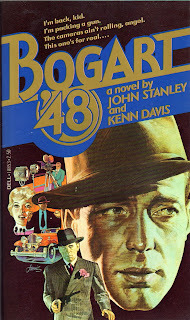 Called Bogart ’48, that book (according to its back-jacket copy) involves “a nightmarish screenplay about to become a desperate reality of murder and suicide ... a chilling plot to blow up the Academy Awards ... a long black Packard and cold, watching eyes ... the immortal Bogey, the unrivaled Peter Lorre, a ravishing starlet named Norma Jean Baker and a pounding race against time.” It’s been a long time since I enjoyed Bogart ’48, but I remember it as being both rich in character and propulsive in its storytelling. Sadly, as Randisi notes in his short post, Davis “hadn’t had a book published since 1990.” It seems he turned back to his first love, art, imparting his complex impressions of the changing times and mores onto his canvases. “I realized that my paintings were not for everyone,” Davis wrote on his Web site, “and that was all right with me, since I only needed one person to buy one painting. I prided myself that I seldom repeated a painting, and in that my work was unique. What I dreamt and imagined and thought about continued to grow.” Many of his paintings he sold on the Internet. Our deepest condolences go out to Davis’ family. Thanks for the helpful post. I've always been curious about the brothers. They were both damned good writers.